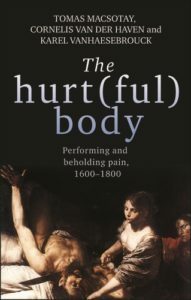 One of our main sources of inspiration while writing The hurt(ful) body has been Jonathan Sawday’s The Body Emblazoned, who also himself contributed to this volume. Jonathan’s book about the early modern anatomy theatre not only deals with the performance of the dissected human body on the stages of early modern Europe, but also with how this dissection already involved the expected gazes of the audiences that watched these performances. In line with this, The hurtful body does not stop at discussing what it meant to have pain performed in art and on stage, but it also aims to say something about how this pain was reflected in the gaze of the onlooker. 2. What did you enjoy the most about writing your book? For all editors the book represented a relief from core concerns of their disciplines, and yet from the start it was clear that the subject of histories of pain had a troublesome place in humanities publishing. It gave us great pleasure that we were trying to remark upon a type of historiographical conundrum – about cruel viewing, about non-linear advancement through secularization and detachment – that the disciplines we worked in tended rather to overlook, resist or, perhaps, had come to suppress. 3. What did you find hardest about writing your book? The difficulty of this book is that it presented a way of thinking about pain in terms of theatrical spaces where visual manipulation, mediation and beholder psychology constantly lurk around the corner. To comment the individual chapters so as to insure this idea is nourished and taken to new levels of insight certainly counts as one of the book´s great challenges. 4. How did you feel when you saw your first published book? 5. Why did you choose to publish with MUP? MUP has been a continuing presence for those teaching critical humanities in the UK. Although not a mainstream publisher on visual culture, it was responsible for, among others, for publishing epochal studies of critical art history: to mention two examples, Griselda Pollock´s After-affects | after-images (2013) and Pollock and Fred Orton´s Avant-Gardes and Partisans Reviewed (1993). Such volumes come to exemplify the deep and continued commitment with critical humanities and social justice that is a heritage not just of the British post-industrial north, but of MUP specifically as an academic publisher. 6. Did you approach writing this book differently to any of your previous work? Yes. It was the first introduction written by three authors from different disciplines. Writing had to be both more cautious and more insistent than in texts that are meant to circulate among scholars of one´s own discipline. Category: Art History, Author Q&A, History	0 Comments.